Christopher McQuarrie’s Mission: Impossible – Fallout is the sixth installment in the Mission: Impossible franchise, and like all long-lasting Hollywood franchises it serves a steady-handed formula. The plot of Fallout, then, needs little explanation. American secret agent Ethan Hunt (Tom Cruise) is tasked with finding and retrieving a series of MacGuffins. To do so he reassembles a familiar team. Hunt will dangle high in the air. He will run at top speed. He will go rogue. All in pursuit of a narrative fueled for the contrived sake of action set pieces. All of which are stellar, so who am I to complain. If nothing else, Fallout is the breeziest two-hours-twenty that you’ll spend in the theaters this summer. It is an achievement of pacing that is accomplished via a script that exercises lean, no-BS beat saturation. There are many plot-driven narrative beats in the film, and they all progress in the same circular way: relay exposition ASAP, pose the seemingly insurmountable problem that will establish the next set piece, and immediately solve the problem with a cracker jack, loosey-goosey plan. Then, execute the set piece. The franchise is the set pieces, and it knows it. Dig into the plot of Fallout with a comb—fine-toothed or not—and you will find a MacGuffin-dependent, plotty action spectacle that is one step more zany than the last Macguffin-dependent, plotty Mission: Impossible film. It is a constant shifting of superiority between members of various secret services, some good and some not. People change sides at moments most conducive to dramatic turns. Plans go haywire at moments most conducive to ratcheted tension. All the while, “danger” is a relative term. It isn’t unpredictable. The twists don’t strike with the cruel irony of an O. Henry short. But self-awareness is exercised here like a Staples “Easy Button.” Do we want the audience to be on board with an over-dramatic about face? Then we will complement the about face with a prompt second about face! Because the plot slides across the lengthy runtime of the film like butter and suspension of disbelief becomes a non-factor thanks to cheekiness, Mission: Impossible – Fallout becomes one of those action films that lives and dies by its overblown stunts and set pieces. There isn’t one that pales in comparison to the others, which also means that no one set piece will make Fallout inherently memorable. Ghost Protocol has the much-talked-about Burj Khalifa sequence. Rogue Nation has the less-momentous airplane sequence. Fallout has…more aircrafts. But Fallout might be better for its lack of a giant set piece. When Cruise dangles on a rope attached to a rapidly elevating helicopter, it is exciting. But it is just as exciting as the hand-to-hand sequence taking place in a bathroom, a set piece that is staged and shot brilliantly. McQuarrie and Cruise are a charmed pairing. McQuarrie shows a knack for knowing what will push an action set piece up from exciting to white-knuckle thrilling. And Cruise is willing to do the stunt himself, which adds a layer of real, palpable energy. 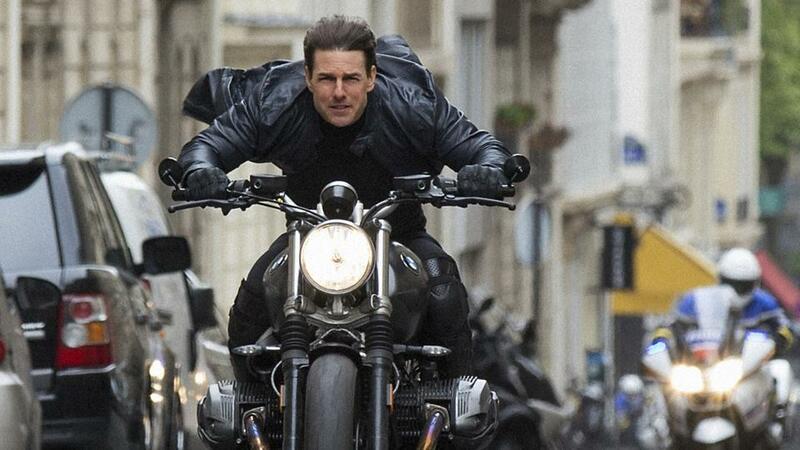 It is a much-discussed aspect of these Mission: Impossible films, but in this sixth entry there is a noticeably seamless pairing of the two minds. Mission: Impossible – Fallout is no flab, all action, and unapologetic about it. It is no masterwork for McQuarrie, as he is more attracted to the stunt choreography and action than a sturdy backbone of consistent acting and strong character arcs. But it is still hard to fault him when he produces such high quality stunt choreography and action.